Is Wireless Radiation Exposure a Danger to our Health? I have been troubled about whether wireless radiation exposure (from wireless routers, our smart phones, tablets, and computers) is really a danger to our health, especially our children. I tried doing my own search on the topic and found evidence for both sides: some saying that it is a definite and disturbing hazard, and others saying that it’s ridiculous and impossible to be a hazard. So what’s the real answer? The International Agency for Research on Cancer (IARC) of the World Health Organization (WHO) recently classified wireless radiation as possibly carcinogenic to humans. Prenatal exposure to cell phones was associated with a higher risk for behavioural problems and hyperactivity in children (in a study of 13,000 mothers & children; Divan et al, 2008). Now what? 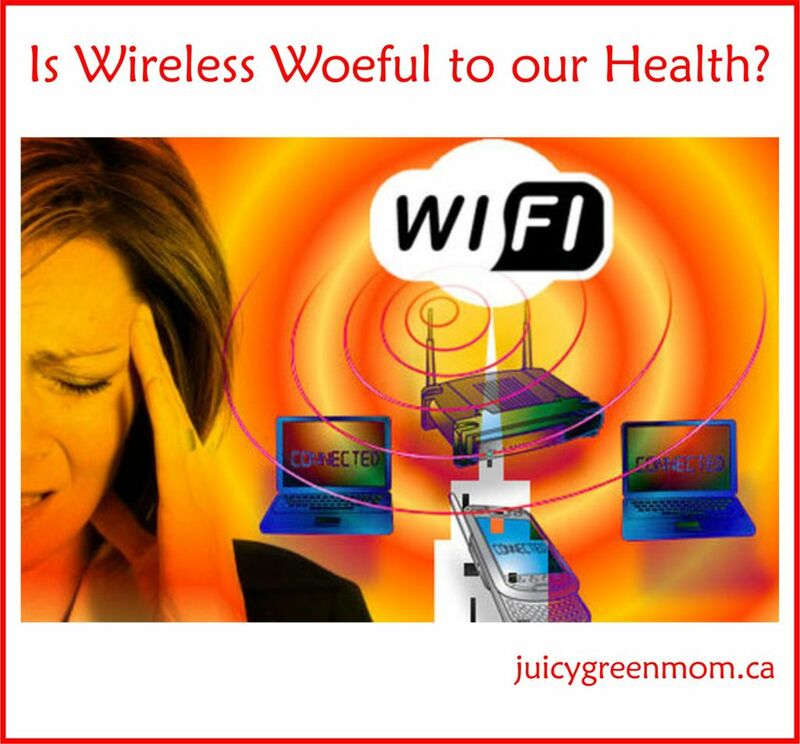 If wireless radiation is everywhere, how are we supposed to protect ourselves and our kids? Here’s a summary from a few sources you can check out here and here. Turn off screens and tech 1-2 hours before bed, and whenever they’re not in use. Power off wireless devices in bedrooms, or at least put them on Airplane/Flight mode so they aren’t constantly transmitting radiation. Use Airplane/Flight mode on cell phones, tables, or laptops whenever possible, especially if you’re handing them to children. On this setting, antennas are disabled so the devices won’t continue to transmit radiation. Try to use wired connections when possible. If you’re going to sit down at a laptop to do some work, consider plugging it in to your network instead of using the wireless. Don’t store your phone close to your body, like in your pants pocket or in your bra. Closer proximity to the device transmitting radiation means higher exposure. 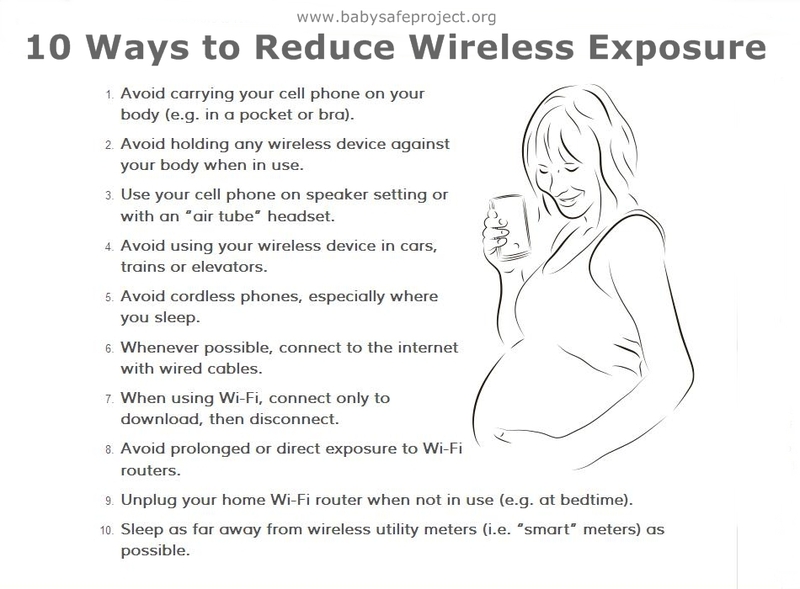 If you’re pregnant, this means not resting wireless devices on your belly to protect your baby. Avoid using wireless devices in cars, trains, elevators or other enclosed spaces with metal. The metal intensifies your exposure because radiation bounces back. I have looked into some of the iPad and iPhone shields out there that claim to shield you from the radiation from your device – and strongly considered buying some when I was really scared. These have not been proven to be effective, so save your money and try to use distance as your shield. It seems overwhelming because there is no way we can escape wireless radiation in this digital age. Being married to a geek means that for me, it will be impossible to eliminate a wireless router and other technology. But like our exposure to toxins and chemicals, each time we choose to power off a device or put it on Airplane/Flight mode, we’ve done something to help ourselves. What things can you feasibly do to start reducing your exposure?